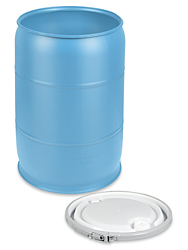 "plastic barrels, fiber drums, empty barrel, empty drum, plastic barrel, cardboard barrel, Jumbo drum, rain Barrels, shipping barrel, 55 gallon drum, 77 gallon barrel, plastic drum, cheap barrels for sale "
Steal ring reinforce top and bottom. Locking steal band accepts a tamper-evident seal. Store up to 650 lbs. of solids. Quick-lock lid (included) won't pop open in transit. Store up to 400 lbs. of liquids or solids. A plastic cover with Metal ring.